With today’s growing e-commerce shopping trends, 87% of consumers would rather purchase directly from a brand online if available. From the first cash register invented 137 years ago to mobile payment apps in today’s world, technology and digital advances have revolutionized the way we pay. Going digital is vital to many business’ long-term success in the marketplace. Before we know it, digital commerce will become the primary shopping channel for U.S. consumers. 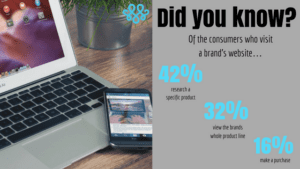 Consumers are increasingly savvy with their online research and more apt to make a purchase online; giving brands a greater opportunity to capitalize on this trend. To entice shoppers to make a purchase, brands must first understand a consumer’s mentality that drives engagement and transactions. We will be exploring the links between consumer expectations and the current state of online shopping. A retailer carries various types of brands and is most likely to be either in a brick-and-mortar store or online. A brand solely sells products from their brand and no others. Brands are less likely to have a brick-and-mortar store and may only have an online shop to purchase. The Gap would be an example of a brand with a brick-and-mortar store. On the other hand, a department store like Nordstrom would be an example of a retailer who sells a variety of brands. While selling exclusively online has its benefits, building omnichannel experiences for consumers allows brands to make it easier to capture the consumer at more points during their shopping journey. Research is a key component in the early stages of the consumer journey. Now more than ever it is crucial for brands to produce engaging content and detailed product information. This initial research phase presents a valuable opportunity for brands to engage consumers with their brand-owned channels. Brand-owned channels mean property (tangible or intangible) that you can control and is unique to your brand. Platforms include a website, mobile site, blog site, and social media channels such as Facebook, Twitter, and Instagram. The more brand-owned media you have, the more chances you have to extend your brand presence in the digital sphere. Things like SEO can help your brand rank higher in search engine results pages. This will capture even more shoppers at the start of their purchase journey. Local search marketing is optimizing your owned properties to generate traffic from location-based search. It is estimated that 43% of all Google, 25% of all Bing, and 25% of all Yahoo searches are location oriented. Local SEO is a critical aspect for many businesses, especially brick-and-mortar stores. Optimizing for local search results can bring you higher in the search rank which gets you more traffic, such as customers who then purchase and can bring up profits for your business or brand. A good way of ranking higher in local SEO is to use your social media to engage in community or local events. You can make updates whenever your company is involved in a local event. You should even interact with other local brands and establishments on social media. how other digital channels and platforms can contribute to positive SEO rankings. While social shares may or may not affect a web page’s position in search listings, your social profiles definitely influence the content of your search results. In fact, social media profiles are often amongst the top results in search listings for brand names. You’ll want to update your social platforms frequently and keep them fresh with content. Social sharing and external links also contribute to a brand’s authority in SEO rankings. Understand that the content on each of your channels publicly will likely be indexed within the search results and potentially be a person’s first interaction with your business. A blog should be the content hub for most businesses, which ideally lives on your brand’s website. SEO friendly blogs should have a proper title tag, meta description, URL, headers, keywords, proper length of content, and internal linking. By doing so, you’re ensuring that your blog content is a source of educational material for your audience and optimized to drive results from the search engines as well. brands must create mobile-first and mobile-only experiences. Mobile first is designing an online experience for mobile before designing it for the desktop Web—or any other device. Some believe mobile first to be “already outdated” because people are still using desktop daily and because “mobile-only” is on the rise. A “mobile-only” strategy might mean, for example, that a company offers its products and/or services uniquely via a dedicated mobile application. According to SmartInsights, apps account for 89% of mobile media time, with the other 11% spent on websites, which proves why some people think “mobile-first” to already be outdated. Regardless of those facts, the point to get across is that your brand MUST have a mobile presence in today’s world to get more recognition. In today’s world mobile steadily keeps gaining in popularity. Especially with younger generations, mobile presence is more prevalent than ever before. Known as next-generation e-commerce, m-commerce enables users to access shopping platforms right in the palm of their hand. Many consumers will even price compare and check product availability on their mobile devices while shopping at brick and mortar retailers. Statistics say 58% research products and compare prices on their mobile devices while shopping in store. Brands who underinvest in digital commerce capabilities struggle to even meet the demands of today’s consumer. Brands must seize this opportunity to go beyond the typical online shopping experience and deliver to the needs of their customers. In the past, simply maintaining a brand content site was enough. Unfortunately, that is no longer the case. Brands must now have an overachieving omnichannel strategy that connects every aspect of the shopping experience. This includes pricing, branding, promotions, and transactions. Companies can simply not ignore the opportunity to sell directly to consumers and influence their purchase decisions. It is essential for brands to make their digital commerce presence a priority in their overall brand strategy. By implementing these digital commerce trends it can create more user-friendly and efficient transactions. This, in turn, increases brand awareness and strengthens customer loyalty.